Biography of Italian Baroque Painter, Founder of Caravaggism. One of the most iconoclastic and influential Old Masters, Caravaggio is revered for his naturalistic style of Baroque painting, a controversial alternative to the classicism of Annibale Carracci, as well as the preceding style of Mannerism. (See also: Classicism and Naturalism in 17th Century Italian Painting.) Best-known for his religious paintings, he used workers, peasants and courtesans as models for his Biblical figures. This naturalism attracted opposition from church authorities and others, who rejected much of his religious art for being too impious. This negative reaction seems to indicate that the Vatican was becoming less worried about the Protestant Revolt, since Caravaggio's down-to-earth Baroque art was precisely what the Council of Trent (1545-63) was hoping for when it demanded a more relevant and understandable type of Catholic Counter-Reformation art for its churches and chapels. In any event, the virtuosity of his painting - he avoided the Florentine disegno approach in favour of the Venetian method of working alla prima, without any preliminary drawing - and his revolutionary handling of Biblical art, made him one of the most influential Italian Baroque artists of the 17th century. His greatest paintings, those that made his reputation as one of the best history painters in Italy, include: The Calling of Saint Matthew (1600) and The Martyrdom of Saint Matthew (1600), for the Contarelli Chapel; Conversion on the way to Damascus (1601) and the Crucifixion of Saint Peter (1601) for the Cerasi Chapel; Supper at Emmaus (1601, National Gallery, London); Death of the Virgin (1601-6, Louvre); and The Entombment of Christ (1601-3, Vatican Museums, Rome). Caravaggio's mastery of tenebrism and chiaroscuro proved so popular with 17th century art collectors and other painters that it started a European-wide trend of Caravaggism, inspiring both Rubens (1577-1640) and Rembrandt (1606-69) among many others. NOTE: Tragically, as well as being a true artistic genius, Caravaggio was also a villainous and violent man with a criminal record which included assault and even murder. After a fortnight of hard work he would swagger about town armed with a sword, looking for a fight. In 1606 he killed a man in a fight, fled Rome and spent his remaining years as a fugitive, dying at 38 of a fever in Porto Ercole while on his way to Rome to (reportedly) receive a pardon. A sad end for one of the best artists of all time. It was during this late period that he painted his masterpieces The Flagellation of Christ (1607, Capodimonte Museum, Naples) and David with the Head of Goliath (1609-10, Borghese Gallery, Rome). Michelangelo Merisi da Caravaggio was born near Milan in 1571, his father was an architect or decorator. Five years later, to escape the plague which was rampaging through Milan at the time (killing his father in the process), the family moved to the town of Caravaggio near Bergamo, (from which their surname came). The young Caravaggio showed early talent as an artist, and when he turned 13, following his mother's death from the plague, he was apprenticed to the painter Simone Peterzano (c.1540-96), a former pupil of Titian and a follower of the Lombard school of art. The Lombard style of painting valued simplicity and naturalism, and this was to have an important and lasting influence over the young painter and his style of art. The fact of his training goes hand in hand with that of his critical reputation. While he was still alive Federico Zuccaro (1540-1609), the first President of the new Academy of Art in Rome, contemptuously referred to him as a poor imitator of Giorgione (1477-1510), while his supporters lauded him as a painter who had no master but nature. Only the sophisticated patron of the arts Vincenzo Giustiniani (1564-1637) saw - behind the naturalistic spontaneity of Caravaggio's paintings - the conscious participation in the 'return to nature' movement that was the central preoccupation of Italian painting during the late 16th and early 17th centuries. Academic critics, on the other hand (like Zuccaro), reproached Caravaggio for painting scenes without history and without action, and for depicting religious scenes without proper regard for the iconography laid down by the Church. Caravaggio's support of the down-to-earth, realistic, anti-humanist ideas that characterize the best of Lombard work in the 15th and 16th centuries, as well as his relationship with Mannerist artists like Giovanni Savoldo (active 1506-48), Moretto da Brescia (1498-1554), Lorenzo Lotto (1480-1556) and the Campi brothers, remains an established fact that is essential for any understanding of his work as a whole. There is no need to linger over the adventures with which Caravaggio's life was strewn. They are of interest only insofar as they help to explain his character and the chronology of his career. When he was about 20, in spite of the differences between his style and that officially approved in artistic circles at the time, he managed to find patrons and aristocratic collectors in Rome. Indeed, despite imprisonment, flight, and every kind of trouble, he continued to produce masterpieces and retained a poetic understanding such as is found only in the greatest masters. One of his most important attributes was that he never lost touch with everyday life, and continued to find the characters in his paintings among ordinary people. Caravaggio arrived in Rome between 1591 and 1592; and no doubt on his way there he wold have encountered the work of painters like Giotto (1267-1337) and Masaccio (1401-1428), whom he was to equal in the power of his imagination and innovatory vision. In Rome, he found life difficult to begin with, and was obliged to scrape a living by producing popular cheap works, although he also began working on paintings of his own. During a stay in hospital at S. Maria della Consolazione he painted a number of pictures that were sent to Seville by the Spanish prior of the hospital. Caravaggio next attended the school of the Cavaliere d'Arpino (Giuseppe Cesari) (1568-1640), a charming, but superficial painter who had no influence upon him, and whom he soon left to settle in the household of his first important patron, Cardinal Francesco Maria Del Monte (1549-1627). During this first period in Rome he produced a group of small easel paintings for collectors, whose style appears markedly personal and their position in relation to 16th-century tradition quite clearly defined. Essentially anti-Mannerist in the relationship of space and image, they take from Mannerist painting the intense, nervous line, while the light colours and the backgrounds bring out the vitality of the subjects. The sharply defined figures occupy the front area of the picture space and this, together with strong lighting, produces a very strong sense of physical presence. The most original characteristic of these paintings is the choice of subject and also the freedom of interpretation with which traditional subjects are invested. For the first time in the history of European painting the theme of Bacchus (1597, Uffizi, Florence) becomes little more than a pretext for the depiction of all kinds of natural events and everyday objects; the adolescent figure of the god, crowned with vineleaves, is treated almost mockingly, and is hardly any different from the Boy with a Basket of Fruit (c.1593-94, Galleria Borghese, Rome). For the first time, an ordinary incident like that of the Boy Bitten by a Lizard (c.1593-94, National Gallery, London) and a biblical event like The Sacrifice of Isaac (c.1603, Uffizi, Florence) are given the same degree of pictorial significance and treated with the same seriousness and dramatic force. There was no hierarchy of values in the many aspects of reality that fed Caravaggio's inspiration. Thus, in another painting Bacchus is depicted as a sickly lad from the taverns - The Sick Bacchus (1593, Borghese Gallery) - while The Penitent Magdalene (Doria Pamphilj Gallery, Rome) is seen not as a courtesan, but as a woman of the people, alone with her sufferings in a poor, bare room. Thus, too, The Rest on the Flight into Egypt (1595, Galleria Doria Pamphilj) is shown as a slice of life comparable to such secular paintings as The Fortune-Teller (1598-99, Louvre), The Lute-Player (1595-96, Hermitage, St. Petersburg), and The Cardsharps (1594, Kimbell Art Museum, Fort Worth). Finally, the single motif of the Still Life with a Basket of Fruit (1601, Pinacoteca Ambrosiana, Milan) strikes the onlooker with its tangible reality. Considered one of the finest examples of modern still-life painting because of its rejection of merely descriptive charm, the work marks a clear break from the genre painting that preceded it. The painting he produced for the Contarelli chapel altarpiece in the Church of S. Luigi dei Francesi, the dates of which have recently been established as 1599-1600 for the side-panels (The Calling of St Matthew and The Martyrdom of St Matthew) and as 1600-2 for the altar painting (St Matthew and the Angel), mark an important stage in Caravaggio's career. These paintings were preceded by a number of works that display the first signs of a change of style that probably owed something to the arrival in Rome of Annibale Carracci (1560-1609) in 1595, and in any case showed a change of attitude towards official classical culture. The Supper at Emmaus (1601, National Gallery, London), with its more exaggerated perspective and its more austere and solemn tone in fact seems to be a response to the grand manner of the Bolognese School, while St John the Baptist (in the two versions in the Galleria Capitolina  and the Galleria Borghese  in Rome) and Amor Vincit Omnia (Victorious Cupid) (1602, Gemaldegalerie SMPK, Berlin) - a kind of parody - are an open, even ironic display of Caravaggio's acquaintance with the 16th-century classical tradition. After his youthful rejection of tradition, Caravaggio now seems to have gone through a period of reflection, and an anxious interpretation of religious events. His artistic beliefs were consolidated, and their revolutionary nature commanded acceptance all the more readily because of the calm certainty with which they were expressed. Boldly translated into contemporary settings (a card table in The Calling of St Matthew, the interior of a Roman church in The Martyrdom of St Matthew), the happenings in Caravaggio's religious paintings are unmistakably captured through the revealing role of light. Directed from the side, from a source outside the painting, light is used to pick out the essential elements of the composition, obeying not objective optical laws but the expressive demands of the artist, halting movements suddenly, as in a snapshot, and plunging the scene into silent, dramatic chiaroscuro. This was the affirmation of Caravaggio's luminism, the cultural roots of which are to be found in Mannerism. The first version of the altar painting St Matthew and the Angel (destroyed in Berlin in 1945) was thought too realistic and insufficiently reverent and was therefore refused. The second was conceived in a more classical way. It is particularly striking for the solidity of the draperies that enfold the angel, as if to hold him up in his flight (Caravaggio was wholly incapable of making an angel fly) as well as for its colours, with their restrained and rather meagre range, which seem to break up at the violent shock of the light against the sombre background of the canvas. Although the colour effects of this painting suggest a Venetian influence in its use of light, it is related to two paintings of the previous year (The Crucifixion of St Peter and The Conversion on the Way to Damascus) for the Cerasi chapel in the Church of Santa Maria del Popolo. The commission was secured for Caravaggio by his new patron, the banker and art collector Marchese Vincenzo Giustiniani (1564-1637), and the pictures were finished, according to documents, in November 1601. Even more intense than the paintings in the Contarelli chapel, these two works are the result of a deeper interpretation of religious subjects, which were from then on almost the only ones dealt with by Caravaggio. Biblical history is translated into popular terms. This, according to some authorities, can be related to the preaching of St Ignatius Loyola and St Philip Neri. In the Cerasi chapel paintings realism is taken to its extreme limits (for instance, the horse's rump in the foreground in The Conversion on the Way to Damascus, which shocked Caravaggio's contemporaries). Through a transformation of chiaroscuro into deep darkness, pierced by occasional shafts of light, the scenes themselves appear with a shattering truth. Caravaggio's other paintings in Rome, before he fled, can be grouped together with these. Around 1602-4 his classical ideas (The Entombment of Christ, 1601-3, Pinacoteca Vaticana, Rome) seem to have found a balance with The Madonna of Loreto (1603-6), painted for the Church of S. Agostino, in which the sculptural beauty of the Virgin is animated by a human tenderness in the silent dialogue with her humble adorers. Caravaggio chose the daughter of one of his poor neighbours as a model for the Virgin in The Madonna of the Serpent (Madonna dei Palafrenieri, 1605-6, Galleria Borghese, Rome). Painted for the brotherhood of the Palafrenieri, the composition is notable for its unusual iconography. At the same time darkness became more pronounced in his paintings, not as a complementary element of light but as one in opposition to it. This may be seen in the St Jerome (1605) and the David with the Head of Goliath (1610) in Rome (both in the Borghese Gallery), in the St Jerome in the monastery of Montserrat, and particularly in The Death of the Virgin (1601-6, Louvre), a silent tragedy lit by a reddish glow. The realism of this latter work outraged Caravaggio's contemporaries. 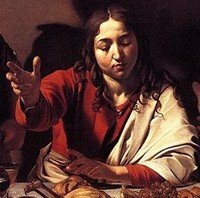 Caravaggio was known to have had a vicious temper and the passion in his paintings was often reflected in his life. An early notice was published on him in 1604 which stated how "after a fortnight's work he will swagger about for a month or two with a sword at his side and a servant following him, from one ball-court to the next, ever ready to engage in a fight or an argument, so that it is most awkward to get along with him". In May 1606, during a brawl following a dispute over the score of a tennis match, he killed his opponent Ranuccio Tomassoni. Accused of murder, Caravaggio fled to Naples where he received the protection of the powerful Colonna family. Safely outside the jurisdiction of the Roman authorities, the most celebrated painter in Rome became the most celebrated painter in Naples. It was probably while he was here that he painted a Supper at Emmaus (1606, Galleria Brera, Milan), treating it as a low-life tavern scene, in which individual figures emerge from a background of darkness. In Naples in 1607 he worked feverishly, but most of the paintings from this period are now lost. Those that survive, Madonna of the Rosary (1606-7, Kunsthistorisches Museum, Vienna), The Seven Works of Mercy (1606-7, Church of Pio Monte della Misericordia, Naples), a Salome with the Head of St John the Baptist (1609-10, National Gallery, London), and Flagellation of Christ (1607, Museo di Capodimonte, Naples) show a change of style in the modelling of figures reminiscent of the classical and Mannerist traditions. However, it is confined in this case to relationships between darkness and light and is used to exalt the most basic aspects of human reality. See also Caravaggio in Naples and Neapolitan School of Painting (c.1600-56). He continued in the same way in Sicily, where he landed in October 1608. During his wanderings - which ended tragically, after a sea crossing, with his death on a beach in Lazio on 18th July 1610 - he created such masterpieces as The Burial of St Lucy (1608, Museo Bellomo, Syracuse), The Raising of Lazarus (1608-9, Museo Regionale, Messina) and The Adoration of the Shepherds (1608-9, Museo Regionale, Messina), a Nativity with Saints Francis and Lawrence (1609, Church of San Lorenzo, Palermo), a Salome with the Head of St. John the Baptist (1609-10, National Gallery, London), and probably the St John the Baptist (1610) in the Borghese Gallery in Rome. The exact circumstances of his death are not clear, it may have been a fever, it may have been another brawl. Caravaggio was only 38 years old when he died, his painting career had lasted little more than a decade. Caravaggio's style of painting was quite revolutionary. Not least because he did not adhere to the strict division between 'high art' and 'genre' themes that had maintained a rather strict separation between religious and popular art since the Renaissance. Whether the subject was a religious story or a portrait, Caravaggio showed outstanding ingenuity as a close observer of people and everyday objects. His figures are as beautiful or ugly as average people normally encountered on the street. However, the viewer is not truly confronted with scenes of daily life in Italy in these pictures, but rather with a highly individualized view of life and an artificial world that has been arranged in the artist's studio. 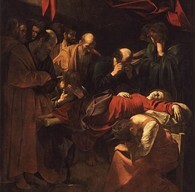 This latter aspect is emphasized through the extreme contrasts in lighting that are typical of Caravaggio's entire oeuvre. Brightly lit, smooth areas of colour form a harsh contrast to dark shadows in a way that had never been seen before, and distinct and earthly tones predominate. Caravaggio's naturalism was something new, and poorly understood by the vast majority of his contemporaries. Furthermore, Caravaggio was not content to simply give his saints the appearance of the models he picked up off the street; it was even rumoured that he gave an image of the Virgin the face of one of his mistresses. Such worldliness troubled the pious churchgoers of the time - they were used to seeing Madonnas of unearthly beauty. The realistic style of Caravaggio's religious paintings amounted to a scandal in the opinion of the Catholic Church, which suspected the artist of using sacred art to his own egoistic ends, thus robbing it of its dignity. The revolution carried out by Caravaggio in matters of form and iconography - and propagated by supporters of Caravaggism - was the result of a radical change in the relationship between the painter and the world. His influence was all the greater because it came in response to a generally felt need for renewal and change and because he was able to achieve this in a highly original, individual and sensitive way. His example led to the establishment of a number of formulas - naturalistic depiction of objects, life-sized figures, lighting from outside the picture, and the expressive use of tenebrism and chiaroscuro that were taken up and spread by his followers. Caravaggisti included Italian artists such as Orazio Gentileschi (1563-1639), Carlo Saraceni (1579-1620) and Bartolomeo Manfredi (1582-1622). In Naples, where Caravaggio's influence was especially strong, due to local Quietism, his followers included the Spaniard Jusepe Ribera (1591-1652), as well as Battistello Caracciolo (1578-1635) and Mattia Preti (1613-99). Other followers included the Dutch painters, Gerrit van Honthorst (1592-1656) and Hendrik Terbrugghen (1588-1629); the German Adam Elsheimer (1578-1610); the Spanish painters Zurbaran (1598-1664) and Diego Velazquez (1599-1660). In France, his followers were the French Baroque artists Moise Le Valentin (1591-1632), Simon Vouet (1590-1649), Georges de La Tour (1593-1652), and Nicolas Tournier (1599-1649), as well as Joseph Wright of Derby (1734-97), and many others. They were also known collectively as Caravaggesque painters, although Caravaggio himself never had any wish to found a school. His influence on European painting ranged from an adoption of his attitude of mind to a close adherence to his pictorial style. His treatment of light and shadow reinvigorated Italian painting by improving the three-dimensional quality of figures. In addition, it permitted artists to control the focus of the painting, thus increasing its dramatic content. In the hands of a master like Rembrandt, it produced greater characterization and emotional depth. Caravaggism was fully exploited by Dutch Realist artists, and by 17th century Spanish Baroque artists working on religious history painting relating to the Catholic Counter-Reformation movement. Caravaggism first fell out of fashion in Rome, in the late 1620s, while it persisted elsewhere in Italy, notably Sicily. In Flanders, Netherlandish Utrecht and eastern France it remained popular well into the 1650s. 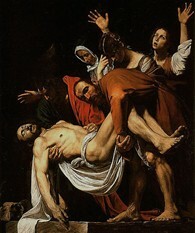 Caravaggio's own reputation declined during the 18th century but revived during the 19th century. Even so, although Caravaggio's poetic realism fascinated 19th century painters like Gustave Courbet (1819-77), Edouard Manet (1832-83) and Paul Cezanne (1839-1906), it was not until the 1920s that his achievements were properly examined by the critics, including the eminent Renaissance art scholar Bernard Berenson (1865-1959) and in particular by the Italian art historian and scholar Roberto Longhi (1890-1970) who defined his style and role in European painting. Longhi placed him among other great European painters in the history of art like Jan Vermeer and Rembrandt, writing that 'with the exception of Michelangelo, no other Italian painter exercised so great an influence'. What begins with Caravaggio, is quite simply, modern painting. Works by Caravaggio can be seen in the best art museums across the world.  For information about Italian Old Masters like Caravaggio, see: Homepage.